Is it useful to think of art in terms of high and low? Are some forms of art “higher” than others? Is classical music a higher form than rock music? Is poetry above detective novels? 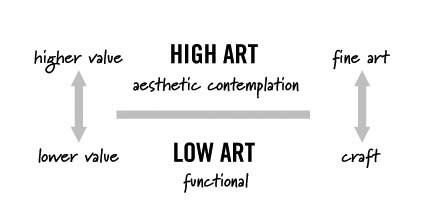 Most people are aware of a distinction between high and low art. High art is appreciated by those with the most cultivated taste. Low art is for the masses, accessible and easily comprehended. The concept of high and low can be traced back to 18th century ideas about fine art and craft. Writers in the 1700s drew a line between work that is contemplated purely for aesthetics (fine art) and work that has some sort of utility or function (craft). The fine art grouping of painting, sculpture, music, architecture and poetry was established at this time. The familiar phrase “art for art’s sake” comes out of this view, and is so culturally pervasive that many people accept it as the “correct” way to classify art. There are instances the fine art method doesn't work well classifying art. A hand-made box with carved decoration is not considered fine art because of its utility. However, the decoration could be aesthetically contemplated. Is the decorative part high and the utility part low? Some travel posters can be contemplated aesthetically in the same way as a fine art painting, but they were intentionally created to be easily accessible and function as mass-distributed advertisements. Does that mean they are high and low art at the same time? What about movies? Movies appeared after the traditional fine art groupings were established. Are they always low art or can they be high art too? Can they be both? Another problem with the fine art/craft distinction is the way it implies value. The fine art view holds in esteem one way of interacting with art—aesthetic contemplation. However, art had other functions before the fine art distinction was made and continues to have those functions now. Art can instruct, entertain, mystify, propagandize and frighten to name just a few. However, the fine art approach reserves the status of “good” for work that is primarily aesthetic. Contemplation is the highest and purest goal for art. Other functions of art are considered somehow impure. Hence the loaded words high and low, which simultaneously classify and judge. 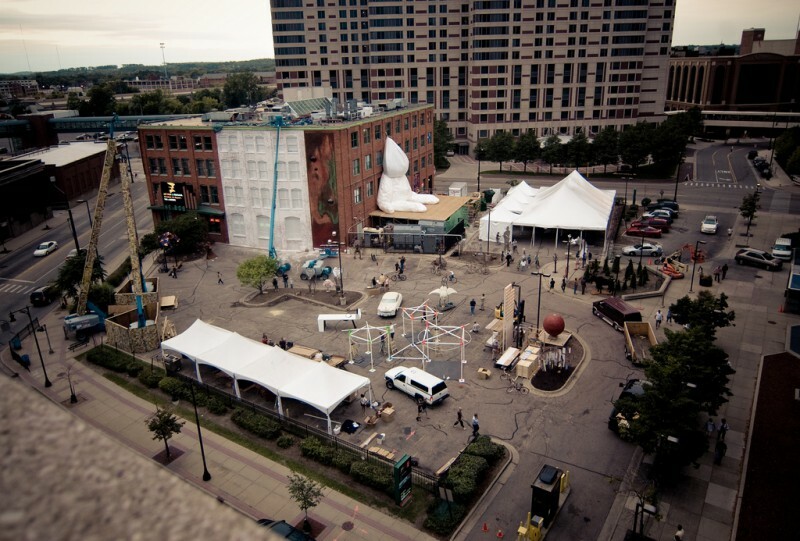 This affects how people interact with the arts. People who feel strongly that high art is good and low art is bad will think of low art as something to be avoided. Some would even consider a poor classical piece better than a great rock song, simply because the classical piece is considered a higher style. Others take a more tolerant position. They hold high art to have higher value, but see low art as “having a place.” Someone with this view would consider a symphony a higher art form, but would be okay listening to pop music in the car. Those who place a greater value on high art sometimes believe that high art serves a kind of spiritual or moral function. A common assumption is that high art is “edifying” and low art is “mere entertainment.” If only the masses can be steered into the concert halls and museums, the power of high art will awaken them from their low art-induced stupor. To them, art has a quasi-religious function, with beauty lifting us to a higher level of spirituality. It’s no accident that museums are often designed to feel like temples. The fine art/craft approach is a problematic way to classify art to begin with, and is further weakened by the way it assigns value to narrow slice of the art experience. Another approach is to simply contrast limited-audience art with popular art, initially leaving value judgments aside. There are several factors that contribute to whether a work will be broadly popular or not. One is how distinctive or unique the work is. Art that places a high premium on uniqueness will generally have a narrower audience. In contrast, popular art often follows proven formulas that have been shown to appeal to large groups. Popular forms are also often deliberately lower in complexity in order to be easily accessible. In short, popular art will very often be crafted to appeal to a large audience with a minimum of effort by the viewer. Lastly, popular art is almost invariably mass produced. Using these criteria, an artwork can be placed along a continuum without the black and white distinction of high and low. Once the work has been placed on a limited-audience/popular art spectrum, the second step would be to judge the success of the work within that context (I discuss judging success in more depth in this article). This avoids the implied value judgment of the words high and low, or fine art and craft. Judging a work’s success in this way can take into account the goals of the artist, including whether the work was made for a limited audience or was meant to be popular.